When you’re searching for a swivel eye snap shackle that you know will last you for years, then the fittings here at Rope Services Direct won’t disappoint. You’re sure to find the one you’re after quickly and without hassle today. Created for servicing mooring requirements and rigging on both commercial and private sailing boats, these swivel eye snap shackles are certainly versatile. Working well with wire ropes or fibre ropes particularly, for total durability and safety they all come equipped with an integrate plunger which is quickly released to un-hinge the opening and very simple to use. The other side has a swivel eye to allow positioning to the perfect location. All our swivel eye snap shackles are made with corrosion-resistant stainless steel (316 grade) and come in a range of sizes (refer to the table below) so locating the correct one for you is quick and easy. It should be kept in mind whilst making your purchase exactly what the load is that you need your shackle to bear, and choose the shackle accordingly. Rope Services Direct stocks shackles in a vast supply of shapes and loadbearing requirements. Tell us the shackle you need on our form so we can get it to you as soon as possible. To speak to us about any aspect of your purchase over the phone, contact us on 01384 78004. 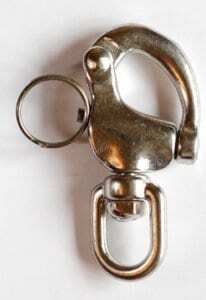 Swivel Eye Snap Shackle Overall rating: 5 out of 5 based on 6 reviews.